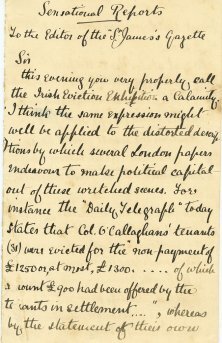 While some concessions were granted on either side, the parties fell short of a settlement and Colonel O’Callaghan decided to apply the rigours of the law. 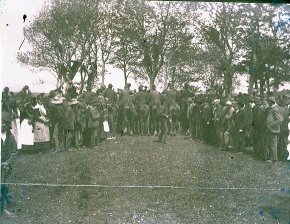 Expecting the evictions to commence, a large crowd (8,000 according to the ‘Freeman’s Journal’) gathered daily in the village during the last week in May. On 2 June the eviction party finally arrived, consisting of the acting Sheriff, the O’Callaghan agent, a Resident Magistrate, the RIC, the 2nd Royal Welsh Fusiliers, bailiffs and 14 emergency men. Church bells and horns summoned 5,000 tenantry, most of whom were at the fair in Scariff. 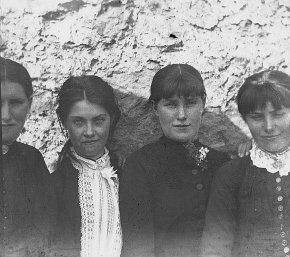 courtesy of the National Library of Ireland. To delay the process tenants barricaded their houses, and, as the emergencymen attacked the walls of the house with crowbars, they were showered with boiling liquid, cowdung and other unpleasant materials. All this was accompanied by the cheers and jibes of a huge crowd. After gaining entry goods and possessions were passed out and placed on the road and livestock rounded up and removed. 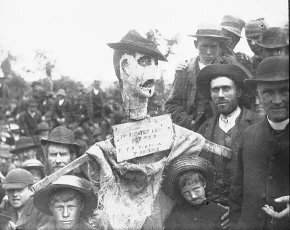 Each evening, a public meeting was held to support those evicted and those awaiting the ‘Crowbar Brigade’. These were attended by a vast crowd who were entertained by local bands and addressed by Michael Davitt and others. On that first day of evictions the delaying tactics of the tenants resulted in only two households being evicted - those of John Liddy, and the eighty year old widow Margaret McNamara, who put up a noble defence. Evictions: Contemporary Account 1 "Clare Journal"
On the 2nd day of evictions, Friday 3rd June, a large crowd attempted to lure the Sheriff and his men to a holding which had not been marked for eviction. The mistake was realised just as the emergencymen were about to make their attack on the house. Three households were evicted on the second day, involving considerable violence. 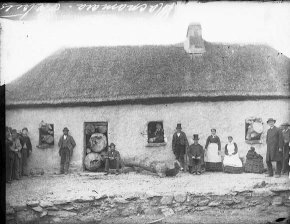 Evictions: Contemporary Account 2 "Clare Journal"
The most notable resistance put up by any tenant was that of John O’Halloran of Lisbarreen whose house acquired the title ‘O’Halloran’s Fort’ as a result. 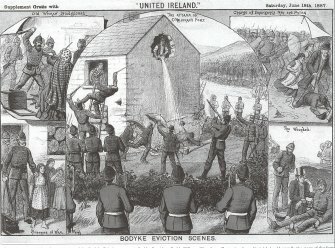 nationalist ‘United Ireland’ of 18 June 1887. 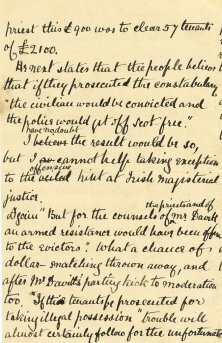 Vivid account left by one of the O’Halloran sons – Frank "Irish Times"
of the National Library of Ireland. 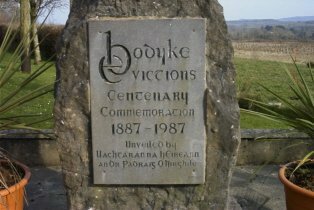 The presence of the local and international press at Bodyke ensured widespread coverage of the evictions, coverage which was considered biased by many. 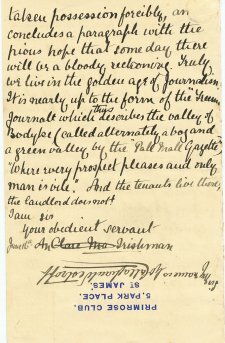 Henry Norman, a reporter with the radical ‘Pall Mall Gazette’, reported, photographed and sketched extensively throughout the proceedings. 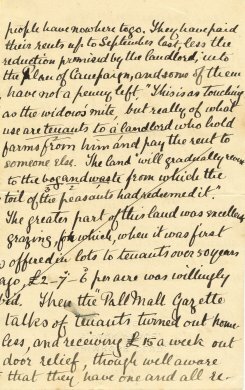 Other liberal newspapers reported the evictions in great detail, to the acute embarrassment of the Conservative government whose Land Bill reached the Commons in June 1887. Balfour, the Chief Secretary, expressed the wish that evictions be restrained during that month. Twenty six people, twenty two of them females, were charged with assaulting and obstructing the forces of the law and tried in Ennis court on June 18th. Some were freed, or given bail, others given hard labour of up to 3 months. Colonel O’Callaghan lost heavily as he had to pay the cost of the sub-sheriff, bailiffs and emergencymen. The evictions also caused an unbreachable rift between the landlord and his tenants which ultimately led to the dissolution of the O’Callaghan Estate. the centenary of the evictions.